Thursday March 3rd 1904 The weather was not so very bad today. I did the regular work and sewed some. My feet are some better. Mollie went to town to stay all night and attend a play. I read all evening. Friday March 4th 1904 I did churning and bread baking today. I did mending in afternoon. Will went up to the sale of the R.R. camp horses. Mollie went home tonight. I cut out work after supper to take down home tomorrow. Earnest Danver here awhile. 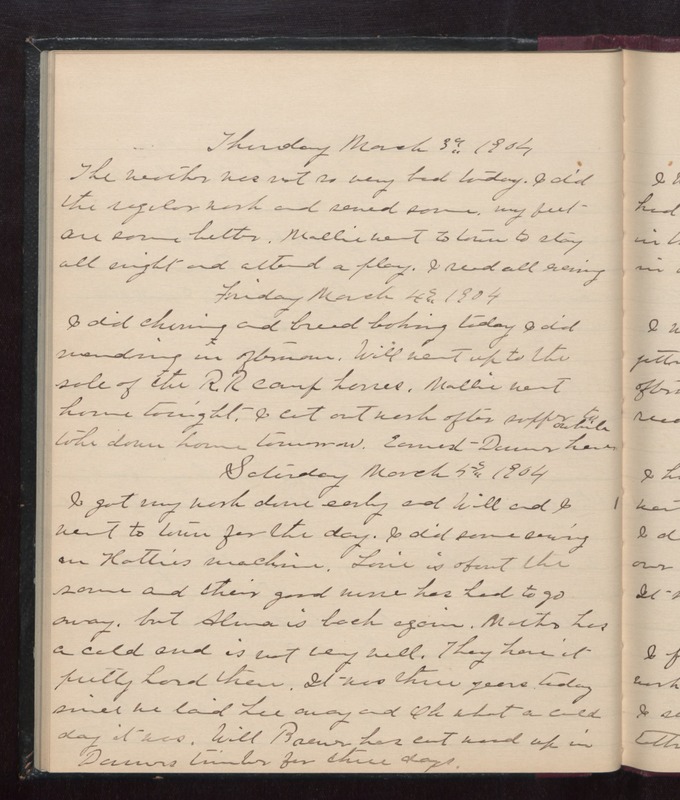 Saturday March 5th 1904 I got my work done early and Will and I went to town for the day. I did some sewing on Hatties machine. Lorie is about the same and their good nurse has had to go away, but Alma is back again. Mother has a cold and is not very well. They have it pretty hard there. It was three years today since we laid Lee away and Oh what a cold day it was. Will Brewer has cut wood up in Danvers timber for three days.